"Not only is the Artery Studios team knowledgeable about anatomy and technology, they're approachable and can recommend any number of demonstrative aids..."
There’s nothing like this uniquely captivating form of demonstrative evidence. 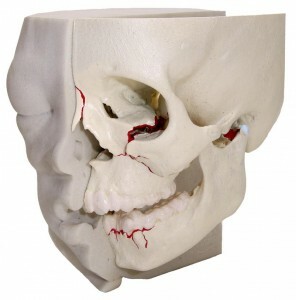 By combining CT data and the latest in rapid-prototyping technology, we can reconstruct an injury in the form of a digitally-sculpted physical model that you, the judge and jury can hold in their hands. Models are hand painted by our medical artists to clearly demonstrate the pathology detailed in your radiology and medical expert reports. Labeled photographs are provided to assist in presenting this tactile form of evidence. To ensure safe handling, models are shipped to you in a customized, hard-shell protective case.